I enjoy graphic novels. I have only read a few in the past, but when thinking about reading a graphic novel for a senior seminar class, I wasn’t sure how it was going to tie in or be taken seriously. For some reason, when I think of a graphic novel I often think of comic books or Sin City, which while entertaining, doesn’t really convey a deeper meaning for me. However, like Wayne and Phil both stated in their blogs, I feel like Satrapi was able to tie her story in with the idea of a graphic novel really well. Some graphic novels are very colorful but Persepolis was not, which I think made it more real in a way. "And so I was lost, without any bearings.... what could be worse than that? 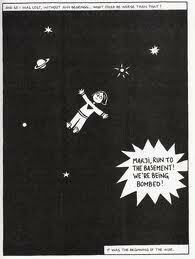 It was the beginning of the war" (Satrapi 71). I wish we read more graphic novels in our classes because I think that they can be informative. We are given an insight into a world we are unfamiliar with through a unique lens. While it is written in a form that we are not always familiar with, it is still a form of literature. I think that like poetry, graphic novels shouldn’t be ignored. I’m really glad we had the opportunity to delve into this, though I wish I didn’t have to wait until my last semester of college to be exposed to this form of writing. Satrapi, Marjane, and Marjane Satrapi. The Complete Persepolis. New York: Pantheon, 2007. Print. This entry was posted in Persepolis by kristan155. Bookmark the permalink. I agree with you, I definitely would’ve liked to see more graphic novels within this course or really any other course. This is the first book that I’ve read in terms of graphic literature and I really enjoyed it a lot. I thought that it gave reading a certain spin on it, at least it did for me. I think that graphic literature is certainly beneficial, especially in terms of what type of learner a reader is. Not only does a graphic novel benefit readers in terms of learning styles, but also in the meaning which they take from the text itself. I believe that Persepolis allowed me not only to connect with the story better in terms of reading about the Islamic Revolution and what Satrapi experienced during it, but I also got to see it all unfold as well.